Maria Angela Fortunata first appears in the Painesville, Ohio, area in 1907. In America, Maria Angela Fortunata was known by her married name, Angela Battista. Maria Angela Fortunata was born on June 17, 1873, at Casalciprano, Italy. She married Pasquale Battista, son of Luigi Battista and Giuseppa Ciolf, about 1893. Maria Angela died on February 8, 1942, at her home, 579 Storr Street, Painesville, Lake County, Ohio, at age 68. Her body was interred at St. Mary Cemetery at Painesville Township, Lake County, Ohio. 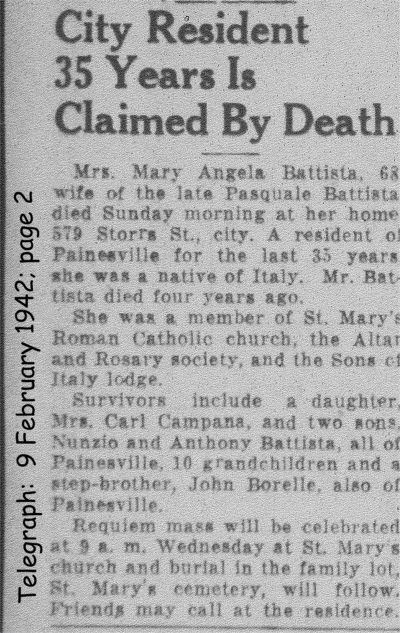 Maria Angela Fortunata, age 34, immigrated to the United States on November 24, 1907, travelling to 109 Storrs Street, Painesville, Lake County, Ohio, joining her husband, Pasquale Battista. She was travelling with her children, Lucia, Nunzio, and Donato. 1. Lucia Battista was born on April 29, 1894, at Casalciprano, Italy. 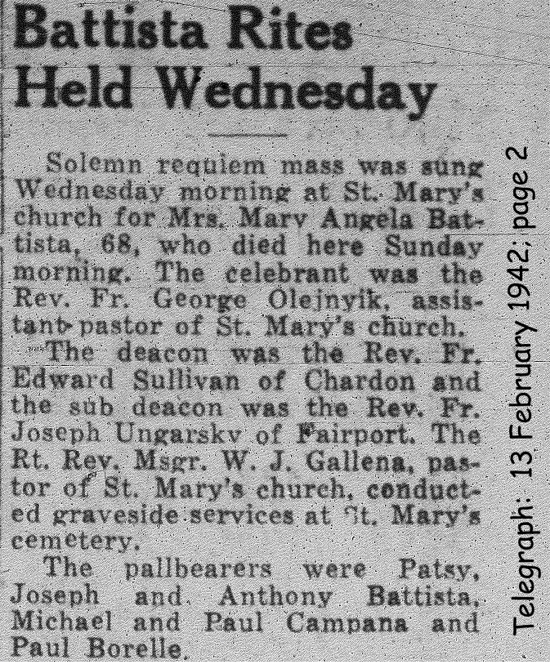 She married Carmine Campana, son of Michele Campana and Angelantonia Iannantuono, on December 3, 1916 at St. Mary Catholic Church, Painesville, Lake County, Ohio. Lucia died on Thursday June 21, 1945 at Lake County Memorial Hospital, Painesville, Lake County, Ohio, at age 51 of pneumonia. Her body was interred at St. Mary Cemetery at Painesville Township, Lake County, Ohio. 2. Nunzio Battista was born on November 22, 1895, at Casalciprano, Italy. 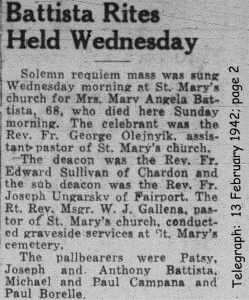 He married Margaret Mary Cardina, daughter of Giuseppe Cardegna and Lucia Maria Amoruso, on April 7, 1921 at St. Mary Catholic Church, Painesville, Lake County, Ohio. Nunzio died on February 18, 1964, at Lake County Memorial Hospital, Painesville, Lake County, Ohio, at age 68. His body was interred at Riverside Cemetery at Painesville, Lake County, Ohio. 3. Donato Battista was born on October 24, 1904, at Casalciprano, Italy. He married Bertha Honkala in 1925. Donato died on April 2, 1968, at his home, 486 Henry Street, Painesville, Lake County, Ohio, at age 63. His body was interred at St. Mary Cemetery at Painesville Township, Lake County, Ohio. 4. 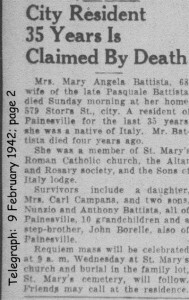 Carmella Battista was born on November 2, 1908, at Painesville, Lake County, Ohio. Carmella died on March 26, 1909, age 4 months, at home on Storr Street, Painesville, Lake County, Ohio, of acute pneumonia. Her body was interred at St. Mary Cemetery at Painesville Township, Lake County, Ohio.